It was a night of celebration, spectacle and emotion in Bloomington, Ind. on Friday night during the World Class Semifinals competition. The celebration came from the corps especially the Madison Scouts and the Blue Stars, the latter of which will return to the World Class Finals for the first time in 29 seasons. The spectacle was provided by the Cavaliers Anniversary Corps, whose ranks include members from all 60 years of the corps' history. The emotion came from the annual age-out ceremony for corps members, recognitions of 2008 DCI Hall of Fame inductees, and winners of the Individual & Ensemble competition. Competitively, the Blue Devils (98.050) retained their grip on first place, with Phantom Regiment (97.675) passing the Cavaliers (97.550) to slide into second place by a slim margin. Only a half point separates first and third, with many captions still hotly contested. 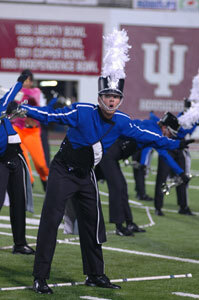 The Blue Devils dominated the sheets in Visual sub-captions, with perfect 20s in Visual Performance and Visual Ensemble. Phantom Regiment took top honors in total General Effect as well as total Music. Consistency was the name of the game for the Cavaliers, with second place finishes in Visual and Music and a third place finish in General Effect. Carolina Crown (4th, 96.700), the Cadets (5th, 95.450), and the Santa Clara Vanguard (6th, 93.625) led a three-for of "blue" corps, with the Bluecoats (7th, 92.800), Blue Stars (8th, 90.575) and Blue Knights (9th, 89.700) placing consecutively. The Boston Crusaders (10th, 88.975), Glassmen (11th, 88.125) and Madison Scouts (12th, 86.375) made the cut for Saturday evening Finals competition. The Crossmen (13th, 85.950), Colts (14th, 85.175), Spirit (15th, 83.175), Troopers (16th, 81.100) and Pacific Crest (17th, 79.650) rounded out the competition. The Blue Stars last appeared in the World Class Finals in 1979, and tonight bested four other Finals qualifiers to take 8th place and secure their appearance in the Saturday competition. "They are elated right now," said Brad Furlano, executive director of the Blue Stars. "Not only the members but the staff and all of the alums that are either here in the stadium or on the Internet following us. It's been a heck of a ride and we're just pleased to be back in Finals." 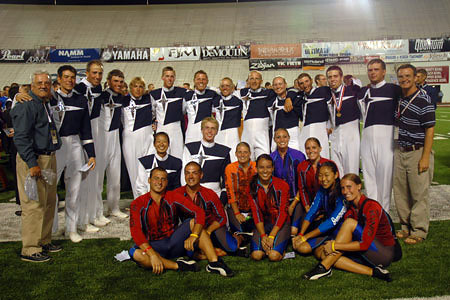 Blue Stars director Brad Furlando (far right) and the 2008 Blue Stars age-outs. The Blue Stars placed at the head of a pack of corps including the Blue Knights, Boston Crusaders and Glassmen, who all have traded placements throughout the season. Furlano said, "The competition is great, the corps are very strong from top to bottom, and we've really worked hard to be in that elite finalist group. Our members, our staff and our design team have done a fabulous job." With another chance to perform, Furlano said, "We feel like we have one more great show in us. We want to go out on a high note and obviously enjoy it, but we also are here to do our job and bring a great quality show to the field." The Madison Scouts will end their season by opening the 2008 World Class Finals Saturday evening. Corps Director Dann Petersen said, "I think the guys have been set up for success all season long. We've been talking about the many ways we evaluate the season, and striving to emphasize personal growth. We're very happy, of course, to get another chance to perform, and I think the crowd's happy about that. We were prepared for tonight to go either way." Petersen said he was looking forward to the last performance of the 2008 Madison Scouts, and said, "There's something about knowing with 100 percent certainty that you're about to perform your final show, and I think it allows guys to let go of any fear, any nervousness that they have and just be themselves." Stephen Chitta (R) with brother Adam. "This is the best age-out experience I could ever ask for," said Madison Scouts baritone section leader Stephen Chitta. "Today's performance was the best of my life, and I hope I have a better one tomorrow." In exhibition tonight, the Cavaliers Anniversary Corps presented a program filled with some of the most memorable melodies and visual maneuvers in their storied 60-year history. From the opening strains of "Somewhere Over the Rainbow," played toward the 2008 Cavaliers members sitting in the end zone, to the final step-over of the color guard, complete with a moment's hesitation, the reunited members from every year of the Green Machine's existence gave a spectacular show. Also at tonight's event, the DCI Hall of Fame Class of 2008 was recognized. Percussion instructor Jim Campbell, Blue Devils B and C director Rick Odello, Colts director Greg Orwoll and DCI Executive Director Dan Acheson were presented with plaques as dozens of other Hall of Fame members stood in attendance. Individual & Ensemble winners from Wednesday were presented with their awards, and Friends of DCI Scholarship recipients were honored before the final scores were announced. Age-outs made moments of their own on the field before both crowd and corps members dispersed for the evening. 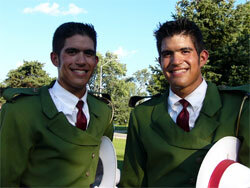 Saturday will lay the 2008 DCI Summer Tour to rest, as a World Champion is crowned at the Finals. Fans would be on the edge of their seats in anticipation if they weren't already giving a standing ovation to all of the incredible performances the corps members have put on the field this season. Tomorrow night will likely have even more surprises in store as this season continues to be one to remember. With photos and assistance by Christina Mavroudis.